Last week was crazy, am I right? But one thing that made complete sense was President Trump’s rationale for firing FBI Director James Comey. 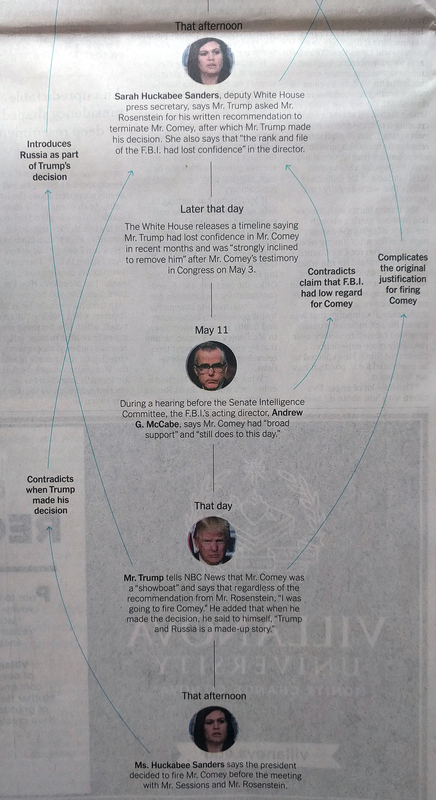 And to prove just how much of a logical, straight-line reasoning there was we have this graphic from Sunday’s edition of the New York Times. Okay, so maybe that is not quite such a straight line. I want to excerpt the bottom half because it clearly shows the contradictions—the top half merely establishes the statements to be contradicted. Yep. It’s all very clear. I particularly like the use of the blue lines and bold set type to distinguish from the linear narrative of the administration. But what makes it work are the concisely written blurbs that detail just what the contradiction was. Credit for the piece goes to Alicia Parlapiano, Stuart A. Thompson, and Wilson Andrews.